Immortality is within our grasp . . . 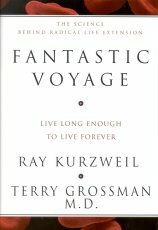 In Fantastic Voyage, high-tech visionary Ray Kurzweil teams up with life-extension expert Terry Grossman, M.D., to consider the awesome benefits to human health and longevity promised by the leading edge of medical science -- and what you can do today to take full advantage of these startling advances. Citing extensive research findings that sound as radical as the most speculative science fiction, Kurzweil and Grossman offer a program designed to slow aging and disease processes to such a degree that you should be in good health and good spirits when the more extreme life-extending and life-enhancing technologies -- now in development -- become available. This bridge to the future will enable those who dare to make the journey from this century to the next . . . and beyond. "Whereas some of my contemporaries may be satisfied to embrace aging gracefully as part of the cycle of life, that is not my view. It may be 'natural,' but I don't see anything positive in losing my mental agility, sensory acuity, physical limberness, sexual desire, or any other human ability. I view disease and death at any age as a calamity, as problems to be overcome." So writes Ray Kurzweil in this brave new handbook to the human machine. According to Kurzweil and coauthor Dr. Terry Grossman, we are in the early stages of multiple profound revolutions spawned by the intersection of biology, information science, and nanotechnology. With the decoding of the human genome, many new and powerful technologies are emerging: rational drug design (drugs designed for very precise missions, with little or no side effects), tissue engineering (regrowing our cells, tissues, and organs), reversal of aging processes, gene therapy (essentially reprogramming our genetic code), nanobots (robots the size of blood cells, built molecule by molecule and placed in our bodies and bloodstreams to enhance every aspect of our lives), and many others. Some of these transformations will bear fruit before the ink is dry on this book. As a result, many experts, including the authors, believe that within a decade we will be adding more than a year to human life expectancy every year thereafter. Bridging the gulf between life today and the distant future -- a fantastic voyage nearly all of us can take -- will be made possible in three steps. Bridge One involves aggressively applying what we know now, sooner rather than later, to dramatically slow down the aging process. The authors describe how you can, in effect, reprogram your biochemistry to change the ancient programs in your genes. They provide guidance on which supplements will contribute to your health and enhance your vitality based on your particular situation. Bridge Two relies on advances in biotechnology that will allow you to directly intervene to stop disease and actually reverse aging. Finally, in a couple of decades, nanotechnology, Bridge Three, will enable us to vastly expand our physical and mental capabilities by directly interfacing our biological systems with human-created technologies. With this book, Ray Kurzweil and Terry Grossman point out the way to something humans have only dreamed about until now -- the promise of living forever. Readers who are up for the voyage are invited along.